Lynn Hutchison is a native of West Virginia whose ancestors teased young George Washington on the western Virginia frontier. He attended Ohio Wesleyan University where he majored in Math, Physics, and Astronomy, hoping, as did all too many others at the time, to follow in John Glenn’s as footsteps. A switch to Computer Science led him to graduate work and a Master’s degree from the University of Arizona and then to Texas, where he worked on the space shuttle. He subsequently returned to Ohio and spent the next 39 years developing industrial computer software. 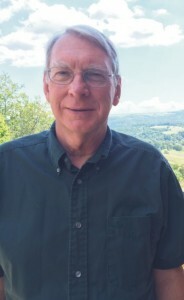 In his youth, he spent summers tending the family’s homestead in Braxton County, West Virginia, and pursuing his interest in birding and star-gazing. Those interests expanded to include family history, local history, genealogy, paleontology, and researching his DNA. A skilled woodworker, he retired to his hand-crafted, mountaintop cabin on the homestead, to care for the land near where the events in this story take place. He authored the book West Virginia Westfalls Their Place in America’s History; the research papers The Truth about Nicholas Gibson, Landowners of the Flatwoods; and several other works. Whether seeking a rare bird, climbing the family tree, or rummaging through the attic, Lynn reminds readers to keep digging.